So if you haven’t already figured it out, this blog post is not coming to you from Laura. This is Laura’s friend Scott, otherwise known as “the Dishboy”. It is Saturday morning, and I didn’t feel like eating another bowl of cereal, by myself, at my house. So, as Laura was running around, busily preparing to leave town for the weekend, I invited myself over to make breakfast for myself in her kitchen. She said, “sure, come on over” (I think she was just too preoccupied to protest much). I had a thought in mind as to what I might like, and upon questioning, it turns out that she had all the ingredients (except the one “secret ingredient” that really makes this sandwich) that needed to be used up anyway, as she was going out of town. Knowing that I abhor the thought of food (of all things) going to waste, I figured that I’d do her the favor of hijacking her kitchen, and using her stove/equipment/dishes to MAKE SURE that food didn’t end up getting thrown out. I’m sure that she appreciated that…as no one wants to live with wasted food weighing on their conscience, right? You should have seen Laura’s face when she came into the kitchen and got her first glimpse of this monstrosity. Once she stopped laughing, of course she had to take a picture! I decided that since I’d hijacked her kitchen this morning, I may as well hijack her blog for the day as well. The picture you see is the result of my creation. These are not for the faint at heart! The calorie load on one of these things weighs in at a whopping 1186 calories, so warning: you may not be hungry for lunch. I hope you enjoy them. 1. If you are using uncooked meats (such as breakfast sausage or bacon), you should cook them first, according to your normal practice. Set aside when done. 2. Add approximately 1-2 tablespoons oil to a nonstick skillet, and fry hash brown patties over medium-high heat (or per package instructions). 3. While the hash browns are cooking, I briefly add the pre-cooked style meat(s) to the pan briefly, to sear/brown both sides of the meats (which enhances the flavor). Set these aside after they are browned. 4. As the hash browns near doneness, fry the eggs. I like my fried eggs over hard, with the yolks broken. Do yours however you prefer. If you are making these in small quantities, then I use a single frying pan, and fry these right in the pan next to the hash browns as they finish up. If you do that, it is a good idea to turn down the temperature during this last stage so you don’t overcook the fried eggs. If you are making larger quantities, then you can cook the eggs concurrently in another pan. Optimally, your eggs and hash browns reach doneness at around the same time. 6. Assemble your sandwich. I like to use this order: bagel, egg, hash browns, meats, cheese, and bagel. 7. Add salt/pepper to taste. Note that the pre-prepared hash browns already have quite a bit of salt in them, as do the meats that I generally use. So, consequently, I don’t typically add salt to mine. 1. These work equally well using only pre-cooked lunch-type meats. If you are not using uncooked meats, you can skip Step #1 above. 2. There is a lot of heat-mass stored in those hash browns. If you’ve been halfway successful at having the bagel come out of the toaster at around the same time the hash browns and eggs finish cooking, your sandwich will be sufficiently hot to melt the cheese and make up for the fact that the meats you cooked at the beginning have cooled significantly. In fact, more than once I’ve bit into one of these and had the burning hot hash browns literally glue themselves to the roof of my mouth using the American Cheese as a type of “hot glue”. Its not fun…watch out. I just read this post, and now? Now I'm going to run around the block. That's how delicious this sounds!! Yum! Yum... 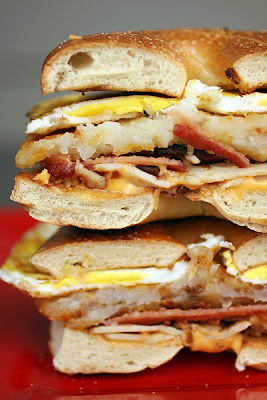 I make bagel sandwiches, but have never thought about adding hashbrowns to them. Great idea... total man food for sure! Love the photo! I like this! Really...I just would adjust the amounts to fit a serving that I can consume and not be guilty about it. I agree with Baking is my Zen! I love your post, I was wondering about who took the picture? Your blog was so much fun to read, I can almost see you in Laura's kitchen. Fabulous post!! And love the bike! Thanks everyone for your kind comments regarding my "guest blog". Alas, I feel that I'm neither creative nor dedicated enough for regular blogging. However, I will try and find a way to appear from time to time in the future. Pink...I'm *definitely* not talented enough to take a picture like that! Laura did that just before she ran out the door. Laura will be back in the near future, and I'm looking forward to her return. Outstanding. This is just the sort of guilty pleasure stuff we like now and then. Your photography has captured it perfectly. Breakfast sandwiches are just the best, aren't they? This is great...looks like I'm making a fry-up for breakfast! Thank-you for commenting on Scott's post everyone. This was a new experience for him. This sandwich so brings me back to my college days! Love savory bagel sandwiches like this! Lucky Laura - I'm sure that she stopped laughing once she tasted the sandwich! Fun post!